George is a retired Philadelphia cop who recruits a professional thief for a ‘safe’ job believed to contain half a million dollars. The safe in question belongs to State Senator Pastore who is currently in jail awaiting further investigations by just about everyone for his nefarious activities. For our antii-hero thief it’s a relatively simple job, even if the house in question is under surveillance. Break in, break out the safe and lob it out the window for George to cart away. Only when it comes for our man to collect his money, George is dead, the safe is missing and someone in a red Ford Econoline van is shooting at him. So begins Three Hours Past Midnight. It’s a fast ride. One long night in our man’s life as he tries to put the pieces together and do right by George, even if it kills him. One thing is for sure; someone has that money. He has to track down everyone who knew about the score. The sleazebag lawyer, the blonde femme fatale, Brenda, who spilled the beans on her ‘former’ boyfriend, the Senator and who set this thing in motion. As the violence and the stakes escalate our guy realizes this is way bigger than just a stolen safe. Crooked cops, a very weird sheriff, gang bosses and grunts and a pair of vicious Albanians who turn up everywhere he goes determined to kill him. 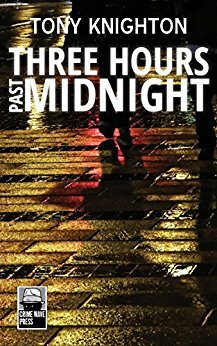 Philadelphia takes centre stage and Tony Knighton the author leads us to places and people you’d rather avoid, but the pace is relentless and it gives Jack Reacher a run for his money. Three Hours Past Midnight is bruising, tough, heartless and there’s not a moment to catch your breath or stem the bleeding. This is crime fiction at its best by someone who knows what he’s doing. BIO: Tony Knighton is both an author and a lieutenant in the Philadelphia Fire Department, a thirty year veteran. Born in western Pennsylvania near Pittsburgh, his family moved to Philadelphia when he was seven. With the exceptions of a short stay in Toronto, Ontario, and the military, he’s been in Philadelphia ever since.